IN.S.A.N.E. 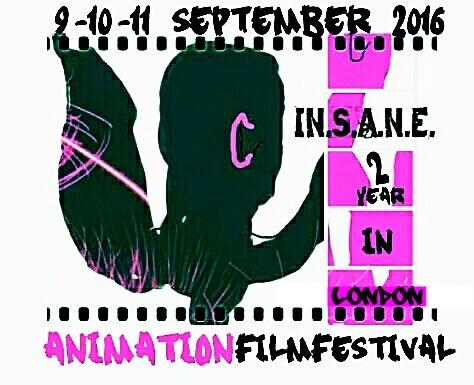 animation film festival 9-10-11 september 2016! | animate everything – frame everyone- INternational Animated Noted Events in Society, with an Echo! Dear ALL creative animation filmmakers! IN.S.A.N.E. animation film festival is back for 9 10 11 september 2016. Last year in Malmö, Sweden, this year in London. Last year IN.S.A.N.E. animation film festival were happy to announce that over 1150 animated films, 1min to a little bit over 1h, from all around the world, had been signed up and 200 of them were screened. All films were screened at different themes, put together, based on the submitted and accepted films. Animations with IN.ternational N.oted E.ventes in Society with an E.cho. For more information, the program for the festival 2015 and new developments, visit the web site and fb page. There were talks by contemporary animation producers from Malmö & Berlin. UR and Midhat Ajanovic Ajan talked about there production and Swedish animation 100 year. There were opportunity to mingle, origami workshop , and to take note of the information and book stalls. After the festival there have been pop-up festivals in collaboration with different organisations with special film themes, as “A marathon of rights” and “Green Cinema”. IN.S.A.N.E. animation film festivals organiser has screened accepted films from FilmFreeway that suited the theme of the collaboration day. Something we plan to do even after the festival 9 10 11 september 2016. IN.S.A.N.E.´s vision & development is to become a platform for animators and the industry. The festival’s vision is to have sections of films that connect together with panels and talks. Sign up at take part & be part of something big! – An INternational Animated film festival that will take a stand for Noted events in Society, with an Echo. – The film festival is free and it is not a contest. Read more what it is about. – IN.S.A.N.E. animation film festival is a private initiative to make a platform for animation artists to show their work, meet like-minded people, grow the interest for animation and stop-motion films and to show different ways to see life in society, globaly. – IN.S.A.N.E.´s vision & development is to become a platform for animators and the industry. The festival’s vision is to have sections of films that connect together with panels and talks. Sign up at take part & be part of something big! This is the second time for the festival to take place and we look forward to having your animation or stop-motion film and you as a visitor and special guest at the festival. *Deadline to submit your film is 31 may, 2016. *You sign up and upload your film here at FreeFilmWay. You will be directed to the film festival’s FreeFilmway page when clicking on the sign up button. You will be notified if your film is selected by 31 July , 2016. We look forward to having your animation or stop-motion film, 1 minute up to 100 minutes, from all over the world, that relates to our theme, International, animated noted events in society. with an echo. We will select the films that will take part in the festival, based on how the film deals with the subject and that it fits into the program schedule. Apart from that we have no rules. By entering your film for consideration for the 2016 IN.S.A.N.E animation film festival, you authorize that your work is cleared for festival exhibition and accept full legal responsibility for the intellectual property therein. Entry into the festival constitutes permission to exhibit your work at the 2016 IN.S.A.N.E animation film festival. IN.S.A.N.E. animation film festival is also hereby granted the right to utilize an excerpt from any film submitted and accepted for exhibition at the Festival for promotional purposes. We look forward to seeing your film and will continue giving you updated information about the film festival program. Practical information about the venue, accomodation and directions will be supplied upon acceptance of your film.